So let’s get this bit out of the way: A Suitable Boy by Vikram Seth is a long book, even by my doorstop-loving standards. It’s more than 1,400 pages and took me almost a month to read. Going against my usual habits, I took a couple of breaks when I thought I was losing momentum, and that was a good thing. There’s a lot of story in this book, and it was good to let it settle in my mind a bit before picking it up again. Because this is a good story, one that is worth the time, but there’s a lot going on, and it’s not a book that suits a restless reader. But it’s also a story that’s not hard to dip in and out of, especially in the first half, when each section tends to focus on a particular family or group and could almost stand alone. After that first half, as the threads were more tightly woven together, I found the spell had been woven, and, for the most part, I was happy to be immersed in this world and didn’t feel the need for a break. So it’s long, but worthwhile. But what’s it about? The novel tells the story of four Indian families and their associates over the course of 18 months in 1952, not long after India became independent. The main storyline is that of Mrs. Rupa Mehra’s quest to find a suitable boy for her daughter Lata to marry. But although that story is the one that begins and ends the book, making it the book’s central narrative, there’s much more happening. The people in Lata’s immediate circle have stories of their own, and the people they know have stories, and so on. We meet people from many different walks of life, and we see how the political and social situation in India at the time affects each person. One thing that struck me as I was reading is how the particular and the universal often work together in novels. A great deal of what happens in the book is specific to its time and place and couldn’t happen anywhere else. So in that sense, reading A Suitable Boy is an education in 1950s India. It’s a way to get a sense of what life was like in this country that was just figuring out what it was going to be. Seth does not use the novel to either celebrate or excoriate. To me, it seemed like a picture, not a polemic. Or at least, when Seth gets opinionated, it’s about kinds of injustice that happen everywhere. But I think this book is successful with readers all over the world because of its universality. Many of the characters’ struggles are not unique to India. Lata’s trouble choosing a spouse is certainly affected by her being an Indian woman in the 1950s, but late in the book, she explains how for her the choice was about who she wanted to be as she grew old. At its heart, her choice is not so different from many prospective brides today. In a similar vein, characters try to navigate relations with in-laws whose values are different from their own, grandmothers spoil grandchildren, women have affairs, young men seek success in business, students fret over exams, and poor people lose their homes. There were so many characters I enjoyed reading about, but I don’t want to say too much because to do so would give away too much of the plot. The sections involving Haresh and his efforts to become successful businessman made me smile, and I enjoyed the Chatterji family and their couplets. I didn’t think I cared much about Saeeda Bai, but all the revelations at the end had me on the edge of my seat. And Mrs. Rupa Mehra’s comment about finding “a suitable girl” for Maan at the end cracked me up. I’d say that there’s the teaser for the sequel, but apparently Seth’s next book, A Suitable Girl, will take place in the present day. Also, I’d love to talk about Lata’s decision at the end, but I’ll save that for the comments. If any of you have read this, what did you think? I don’t know anything about Seth’s own background, so I didn’t have that knowledge to go on. I wasn’t exactly surprised by the ending, although I wasn’t sure which man Lata would choose. I think I was expecting Amit to be her choice, but that’s because he would have been *my* choice. You make an interesting point in your review about the characters. I found them to be very vivid and entertaining, but some of them definitely come alive more than others. Every time I hear this book title it nags on my conscience…I started it once upon a time (high school?) and got about 200 pages in before I put it down for something else. The book is still wandering somewhere around my parents’ house, in fact…I didn’t get very far in this particular one, but I remember thoroughly enjoying two of Vikram Seth’s other books, An Equal Music and Two Lives. I was especially wooed/impressed/in love with Two Lives. Now if I could just give that big ol’ doorstopper A Suitable Boy another go…Thank you for the inadvertent encouragement! It’s definitely worth the time. And it helped me a lot to treat the early sections almost as interlocked novellas because for the first half of the book, the sections almost do stand alone. I’ll almost certainly read his other books at some point. I hear great things. I read this when it came out, having absolutely loved The Golden Gate, which is very much shorter. It’s well worth checking out. I’ll look into that one–I do want to read more of his books. I haven’t read this novel (remiss of me, because it certainly sounds like the kind of sprawling book I would like), but I have read A Fine Balance which covers some of the same territory–although, based on what you’ve written here, I think the ending of A Fine Balance is more downbeat. Have you read it? 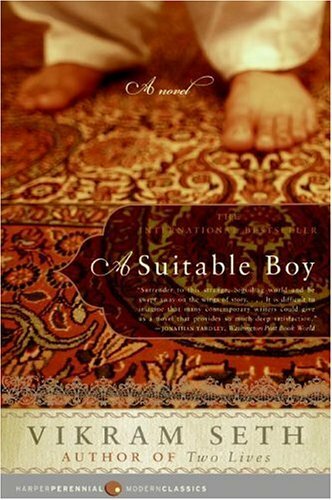 If so, how does it compare to A Suitable Boy? I’ve not read A Fine Balance, but it’s been on my list for years. The ending of this is a little ambiguous but mostly happy. It’s hard to know how well things will go for all the characters, but there’s a sense of optimism about it. A Fine Balance is WAY sadder than A Suitable Boy, in my opinion. But I think Mistry is generally depressing. I don’t think the two are very similar in terms of plot and themes, though they are both family dramas, so I would recommend you try this one, Deb! I would say A Suitable Boy more closely resembles Middlemarch than any other boom I have read. But it is all it’s own, of course! I like sad stories, so I probably will check out Mistry at some point. And I agree that Lata made a sensible decision. As much as I liked reading about Haresh, i think he’d get on my nerves to know, but Lata’s arguments made sense. And I think he’d be good to her, more so than the others perhaps. Oh, I loved this book. It is really long but you feel like a complete part of Serh’s world by the end of the novel. I remember being a bit disappointed with Lata’s practical decision – I wanted her to pick the poet, as that’s what I would have done…. I would have picked the poet, too. But once I realized that I’m not Lata, I felt better about her choice. I really loved this book – it is one of my all time favourites. I read it a long time ago and it is about time I re-read it. It is book that will stand many re-readings I’m sure. I was initially surprised by her choice at the end (I thought it was going to be the poet too!) but immediately thought she was right, and that it would make her happy in the long run. I loved Amit’s family so much that I wanted Lata to be part of it–and she did seem to enjoy being with them. But when she explains her reasoning to her friend, I could see how sound it was. With the sequel coming in a couple of years, I’m eager to see how it turned out for her! I had a copy of this at one point, but I know I didn’t get too far in reading it, and I’m not sure now what happened to it. I’m very fond of family sagas and interlocking stories – this makes me think I need to look for it again. It’s worth making the time for. I started it when I was at home on a week of staycation and had time to make some serious headway with it, which helped a lot. It’s just occurred to me that all review posts about enormous chunksters like this would benefit by mentioning whether it’s a pick-up-and-put-down sort of book or not. That is valuable information to have! It’s not a disqualifier either way, but it’s good to know that I don’t absolutely need to have a huge chunk of free reading time (like a very long airplane ride or a camping trip) in order to pick up A Suitable Boy. I’m not sure I would have finished this if I’d been reading it at a busy time, but it was definitely a book I could put down as needed. Each section is about 100 pages, and I generally just read a section or two each day. I haven’t read one of those huge family sagas in so long. Perhaps this is one of the things I should consider for next fall, the second year of my empty nest. It would be a nice one if you want to see lively family life in action–there’s lots of families to visit in it. I’ve had this book on my shelf for years and I really want to read it but the size of it is daunting. Glad to hear you enjoyed it so much though. Perhaps next time I stand before the shelf looking at the book I will remember that and actually start reading it! Jenny put it on my list of books to read this year; otherwise, I don’t think I’d have gotten around to it, but I’m glad I did.